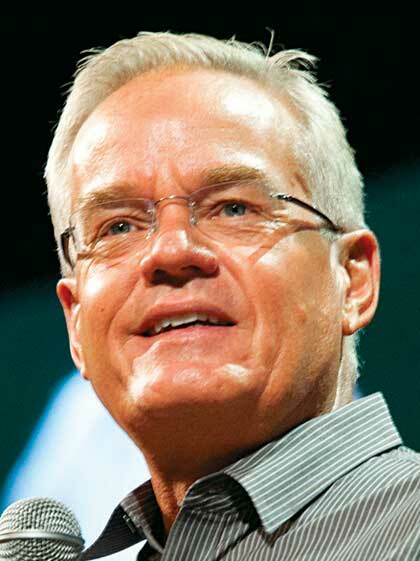 Bill Hybels is the founding and senior pastor of Willow Creek Community Church in South Barrington, Illinois, which has six regional congregations and a total weekend attendance of more than 24,000. He is the bestselling author of more than twenty one books, including Simplify, Axiom, Holy Discontent, Just Walk Across the Room, The Volunteer Revolution, Courageous Leadership, Too Busy Not to Pray, and Becoming a Contagious Christian. Hybels also serves as chair of the board for the Willow Creek Association, a not-for-profit organization that equips and empowers more than 14,000 Christian churches from 92 denominations. WCA's premier event is the Global Leadership Summit (GLS), a world-class, two-day leadership event that gathers the best and brightest leadership speakers in both the church and marketplace worlds. The GLS infuses vision, skill development, and inspiration in Christian leaders so that local churches around the world can reach their full Kingdom potential. With more than 1.8 million participants to date, the Global Leadership Summit is the largest leadership event in the world. The GLS telecasts live from Willow Creek's central campus (near Chicago) to more than 260 churches in the US every August. Then, throughout the fall, Summit events take place via DVD and live hosting in an additional 350+ global cities. In 2013, GLS events reached more than 170,000 leaders in 100 countriesand were translated into forty-five languages. Hybels convened the first Leadership Summit in 1995, following a prompting he sensed from God to help pastors develop their Romans 12:8 spiritual gifts of leadership. Since then, he has become a highly sought-after speaker who utilizes his leadership expertise and church experience to train and equip Christian leaders as they seek to transform their churches and communities with the hope of Christ. Drawing on well-honed wisdom acquired over the past four decades, Hybels speaks and consults internationally, utilizing his passionate style, relevant teaching, and cutting-edge leadership principles to equip leaders of the local church. Willow Creek Community Church began in 1975 when Bill Hybels and a ragtag team of young people gathered in a rented movie theater with a vision of turning irreligious people into fully devoted followers of Jesus Christ. Today, Willow Creek is one of the largest churches in North America, and one of the most influential. Hybels holds a bachelor's degree in biblical studies and an honorary doctorate of divinity from Trinity College in Deerfield, Illinois. He and his wife, Lynne, have two grown children and two grandsons. Bill Hybels es fundador y pastor principal de Willow Creek Community Church y presidente de la junta directiva de Willow Creek Association. Cada año convoca a la Cumbre Global de Liderazgo, un evento de liderazgo de clase mundial que capacita a 170.000 líderes de más de 100 países. Bill, un comunicador excepcional, habla en todo el mundo sobre asuntos estratégicos relacionados con el liderazgo, el evangelismo y el crecimiento de la iglesia. Es el autor de más de veinte éxitos de librería, incluyendo ¡No tengo tiempo para orar! y La apacible y poderosa voz de Dios.